The SAFE-T-TRIP® provides an operator with the ability to safely trip a circuit breaker from a distance reducing the potential risk of hazardous arc flash. The SAFE-T-TRIP® is a durable battery operated hand-held device equipped with a 30ft USB cable. During operation, the USB cable is plugged into the port on a compatible URC trip unit. The USB cable allows for 2-way communication between the trip unit and the SAFE-T-TRIP® device. The power needed to initiate a trip is also provided through the USB cable. The USB cable is permanently attached to the SAFE-T-TRIP® device and no other USB devices are able to initiate a remote trip. The SAFE-T-TRIP® requires a specific sequence of button presses in order to signal the trip unit to open the breaker. This is to ensure that there are no accidental or premature trips while using the SAFE-T-TRIP®. If a trip unit is installed on a breaker that is located behind a cubicle door, a USB extension cable and legend plate is provided in the retrofit kit. This provides a permanent USB connection from the AC-PRO-II® to a USB port that is accessible at the cubicle door. The 30ft cable features a right angle mini-USB connector for the AC-PRO-II® and a USB port with cover, and a threaded nut for securing to the cubicle door. This is how the finished installation looks on a breaker cabinet door. This example shows the port cover removed and the SAFE-T-TRIP® connected. The SAFE-T-TRIP® Device is powered by a 9-volt battery that will power up the trip unit and initiate a trip even if there is no power coming to the trip unit from CTs or an external power source. The battery is very easy to change using the battery access door on the front of the unit. There is also a "Battery OK" LED indicator that notifies the user when the battery is reaching the end of its useful life. The SAFE-T-TRIP® device can be used to determine if the breaker mechanism needs service. 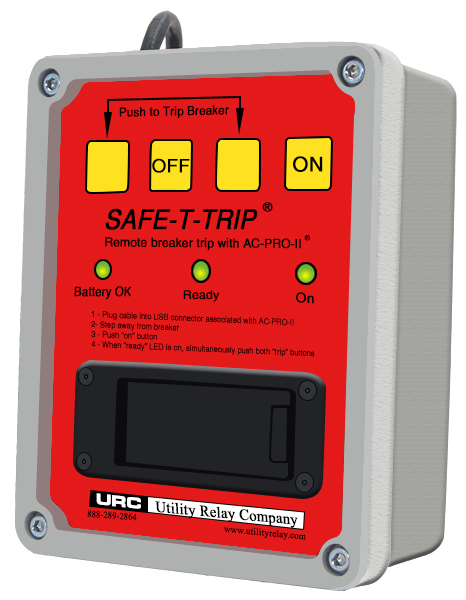 All of the URC trip units that are compatible with the SAFE-T-TRIP® device also have the patented Sluggish Breaker® detection system. Sluggish Breaker® detection determines if the breaker mechanism needs service as indicated by slow operation during the first trip. Operations after the initial trip are faster because the breaker mechanism was exercised during the first trip. When the trip unit initiates a breaker trip, it measure the time between triggering the actuator and when each pole interrupts the current. If this time is greater then the setting, the Sluggish Breaker® alarm is set. The SAFE-T-TRIP® device can be used to initiate the first trip before racking out a breaker. If the Sluggish Breaker® alarm is set, that is an indication that the breaker mechanism is in need of service. The operation of the SAFE-T-TRIP® Device is very simple. The operator plugs the USB cable from the SAFE-T-TRIP® device into the USB port on a compatible trip unit. Or into the extension cable USB port on the cubicle door. After stepping away from the breaker the operator will turn on the SAFE-T-TRIP® Device. The SAFE-T-TRIP® device will communicate with the compatible unit and make sure it is ready to be force tripped. When everything is ready the “Ready” LED will be on. Once the "Ready" LED is on, the force trip can be initiated by simultaneously pressing the 2 trip buttons. The trip unit will receive the force trip command and will fire the actuator to open the breaker. Once the remote operation of the breaker is complete the operator can unplug the SAFE-T-TRIP® device. The operator can then check to see if the trip was recorded as a Sluggish Breaker® operation.